Did you know that oral cancer claims at least one life per hour? We believe even one life lost to oral cancer is far too many – that’s why Tempe Smiles has invested in the latest screening technology to benefit our valued patients with OralID. The current survival rate for oral cancer is 57% but that statistic improves to 80% with early detection. OralID is our most powerful tool when it comes to moving the odds in your favor. How Does OralID Cancer Screening Work? 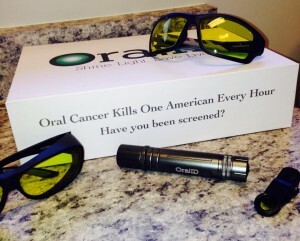 OralID is a revolutionary technology that makes oral cancer screening easier than ever before. Little different from an everyday flashlight, OralID is entirely non-invasive and uses powerful fluorescent technology to help doctors identify abnormalities missed by the naked eye. OralID shines a light on abnormalities below the surface of the skin well before they can be seen or felt. When cancer is your enemy, any additional time you can buy makes for a powerful ally. Our revolutionary cancer screening process takes as little as 2 – 5 minutes. How much does oral cancer screening cost? In an effort to fight oral cancer, Tempe Smiles has made this potentially lifesaving technology affordable for everyone. Don’t wait – call and schedule an appointment with us today.